Frank Würthwein is the Executive Director of the Open Science Grid, a national cyberinfrastructure to advance the sharing of resources, software, and knowledge, and a physics professor at UC San Diego. He received his Ph.D. from Cornell in 1995. After holding appointments at Caltech and MIT, he joined the UC San Diego faculty in 2003. 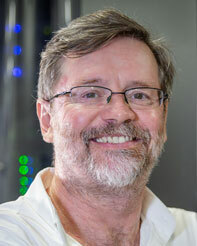 His research focuses on experimental particle physics and distributed high-throughput computing. His primary physics interests lie in searching for new phenomena at the high energy frontier with the CMS detector at the Large Hadron Collider. His topics of interest include, but are not limited to, the search for dark matter, supersymmetry, and electroweak symmetry breaking. As an experimentalist, he is interested in instrumentation and data analysis. In the last few years, this meant developing, deploying, and now operating a worldwide distributed computing system for high-throughput computing with large data volumes. In 2010, "large" data volumes are measured in Petabytes. By 2025, they are expected to grow to Exabytes.